"The Conscience of the King" is episode #13, production #13, and aired on December 8, 1966. It was written by Barry Trivers and directed by Gerd Oswald. The episode takes its title from the concluding lines of Act II of Hamlet: "The play's the thing/Wherein I'll catch the conscience of the king." The episode is notable for being the final appearance (in production order) in the series of Grace Lee Whitney. Whitney was already notified that she was fired from the series a week before filming on this episode began. Her limited walk-on scene was the last she had to film for Star Trek, before her return in Star Trek: The Motion Picture. 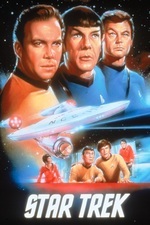 When I was young I considered this one of my favorite episodes, but that may have been connected to my use of it (more theoretical than practical) as a defense of the seriousness of Star Trek. They did Shakespeare! It's not just spaceships and laser guns! In any case, the black "mask" on half his face worn by Leighton was definitely one of the scariest things ever to small me. I blame the Simpsons for making me assume that Kodos was a Klingon. Because Kang and Kodos. And Kang actually was a Klingon, see. I watched the episode in 2 parts (got interrupted, took a few days before I could TV again) -- I can't remember if the beginning of the episode explained how out of 2000 people, 20 years on there were only 9 survivors? I liked that Uhura was singing again. The spray bottle poisoning shot was pretty cheesy and reminded me of something I did for a *high school* film project. I'm completely a week behind on my viewing (thanks a lot new fall season of television! ), so finally finished this episode yesterday, and yet, still a little fuzzy on the details. My biggest distraction in this episode was Lenore, Kodos' daughter. First, it was Kirk's seduction of her which was a little yucky (at least she's an adult, unlike Miri), for the entire purpose of establishing a relationship to learn more information and to lure the troupe onto the Enterprise. Second, the acting by Barbara Anderson kind of fell apart at the end, once she was exposed as the murderer, she across as a little too....crazy. In all, though, I definitely liked the episode. The scene in which Kirk confronts Kodos, it was a nice question raised, "If those supply ships had not come so soon, Kodos would have been considered a hero!" "But they didn't, and society has labeled Kodos for what he did!" (Something like that), but it's an interesting argument that sometimes the worse fiends of history are simply heroes/saviors who were not the beneficiaries of expectations. I enjoyed the interspersion of Shakespeare through the episode. The refrain of blood on hands by actors who had begun the episode portraying Macbeth, for example, and the very core aspect of theatrical tragedy of trying to do the right thing, but those acts ultimately bring about the very tragedy trying to be avoided. In this instance, Lenore killing off the eyewitnesses to her father's acts, and thus, drawing attention to him that results in his death. If she had never killed the doctor, Kirk would have quite frustratedly left the planet and his friend and never considered the troupe again. (And as pointed out on Memory Alpha, a whole lot of this episode is based off of Hamlet). The poisoning of the drink was almost hilarious in its silliness. Lenore apparently carries so much of the poison with her, it's best kept in a spray bottle. Incidentally, Edgar Allen Poe's poem is dedicated to a beautiful dead woman named Lenore, and this involves a deadly beautiful woman named Lenore. Uhura singing is always fun and I really liked the aspect of Riley, assigned to a completely boring and isolated post on the ship, demanding/yearning for some kind of contact with his fellow crew mates. It humanizes the crew in a way that very few Star Trek shows in general bothered to do outside of the main cast. I'm still mixed, as well, did Kirk move Riley to keep him safe or to use him as bait? Another nitpick was Kirk's emotional attachment to Lenore, as indicated by McCoy bugging him at the very end of the episode. At best, Kirk had time to develop a bit of a crush, but this wasn't the next Mrs. James T. Kirk.